The shortest flight path (the great circle) from Manchester Airport (53°21'13"N 02°16'30"W) to Cape Town International Airport (33°57'53"S 18°36'06"E) is illustrated below, entailing leaving Manchester Airport on a heading of 162° (south) and travelling 9882km to Cape Town International Airport. 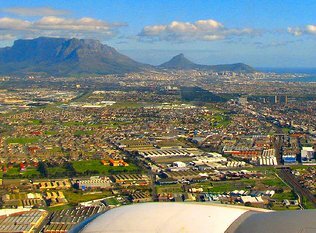 Flights from London to Cape Town are often more competitively priced than flights from Manchester to Cape Town Airport. An option is to travel from Manchester to London and then to travel from London to Cape Town. Johannesburg contains the main airport hub in South Africa (and indeed, in Africa) and flights from the UK to Cape Town are sometimes cheaper via Johannesburg. An option is to travel from Manchester to Johannesburg, and thereafter travelling from Johannesburg to Cape Town (there are often cheap flights available from Johannesburg to Cape Town on the various South African low cost carriers - Kulula, Mango and 1time airlines). Alternatively, hop onto a flight from Manchester to London, thereafter flying from London to Johannesburg, and then travelling from Johannesburg to Cape Town.